1. Fill up the mason jar with peaches, strawberries and grapes. 2. Pour in vodka a 1/4 of the way up the jar. Fill up the remainder of the jar with wine; cork the rest of your wine. 3. Chill sangria concentrate overnight or at least for several hours. 4. Pack up the sangria concentrate, 1-liter bottle of Fresca and remaining wine in an insulated bag. 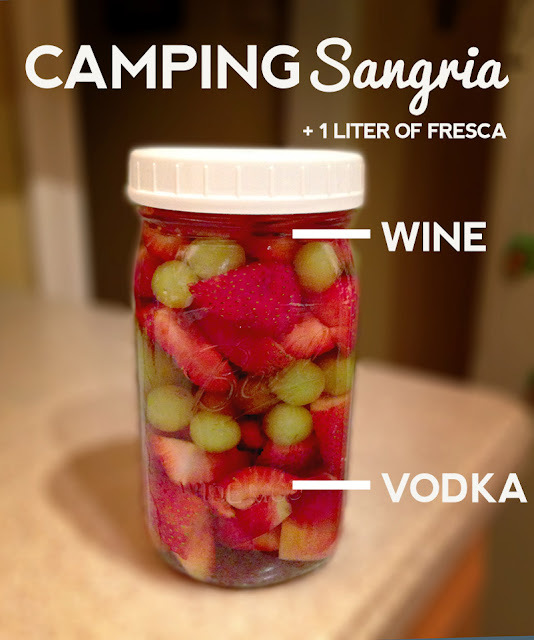 When you get to the campsite, mix all 3 together in the pitcher and enjoy!